HP-UX 11i v3의 ndd 설정에 다음과 같은 내용이 있다. send system calls. When set to 0, copy avoidance is disabled. indicate whether copy avoidance is supported and in use. 이 값을 1 로 설정하면 send(2) system call 에 대한 copy avoidance 최적화를 통해 성능향상이 가능하다는 설명이다. 여기서 copy avoidance 가 무엇을 이야기 하는지 개념적으로 살펴 보자. 위 그림은 서버에서 동작 중인 네트워크 애플리케이션이 disk 에서 데이터를 읽어 네트워크 카드를 통해 송신하는 과정 중 데이터 흐름을 간단히 표시한 것이다. 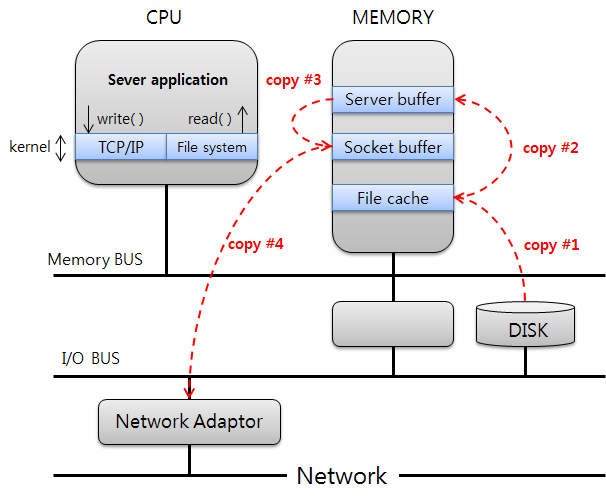 file cache, 애플리케이션 버퍼(위 그림에서 Server buffer), 소켓 버퍼(Socket buffer)를 통해 NIC 로 전달되는 여러 번의 copy 는 메모리 및 I/O bandwidth를 사용함은 물론, copy 시의 checksum 비교 등 시스템 자원을 사용하게 된다. 두 말할 필요도 없이 copy 횟수가 줄어든다면 (copy avoidance 최적화를 통해) 성능향상이 가능할 것이다. socke_enable_ca 를 1로 설정하는 경우 애플리케이션의 변경 없이 VM(Virtual Memory) subsystem 의 도움으로 User space 에서 Kernel space 로의 copy (위 그림에서 copy #3) 를 피할 수 있게 된다. send(2) 시스템 콜 호출 시에 이런 동작이 일어나게되므로 outbound 데이터가 소켓(socket) 을 통해 나갈 때 성능 향상이 있을 것이다. This entry was posted in Network and tagged copy avoidance;ndd;socket_enable_ca, HP-UX. Bookmark the permalink. 다른 유닉스나 리눅스는 이 내용도 참고가 될 듯하네요.